We love typography. And Olly Murs love it as well. The English singer/songwriter wanted something really awesome for his music room combining typography and his inspirations in music. London-based designer Alex Fowkes made this idea possible. 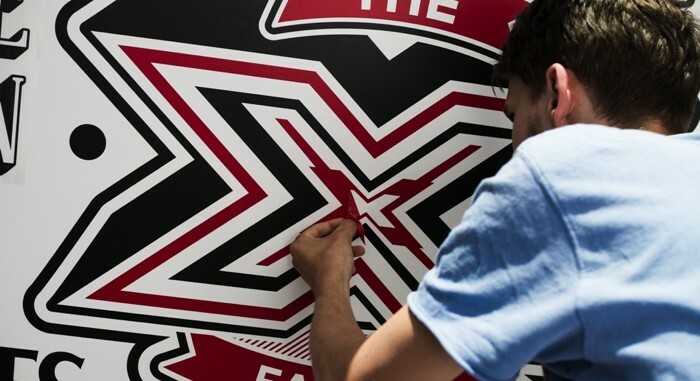 Alex, whose typography work in the Sony Music Timeline project last year gained a huge popularity online, created another impressive work in Olly Murs’ music room featuring columns of typography and illustrations of various names and icons in the music industry. The small space was transformed from a minimalist music room into a more inspiring and creative entertainment space. YTD: Is there any significant difference between working on this project and your work for Sony? ALEX: The biggest difference between this one and the timeline was the size of the room. This meant the artwork was going to have to be seamless. This made it quite difficult as the printers have a set width but are roll fed so I can go as long as I want. So I had to design with columns but have overlapping parts so it looked like one long piece opposed to just columns of type. It made a much different impact too, especially considering it’s just one room. YTD: What are the materials you used? ALEX: The material used is CNC cut vinyl all roll fed. It’s a great medium to use. It’s both versatile and constrictive in different ways which means you have to play around with your possibilities with the material in mind. What I mean is that vinyl can be cut into any shape possible, but you can’t really used anything below 4/5 mm (unless you want application to be a pain). YTD: How long did it took you to finish this installation? ALEX: The installation of the mural took 2 days. We had a few issues with the weather. It was so warm that the vinyl adhesive was really sticky, this meant that when peeling off the backing often letters were still really tacky and stay stuck to the backing paper. This meant it took a lot more time to peel off than usual. But it allowed us to take a lot of care over it and make sure it was right. It’s different when it’s a residential property, you have to really really make sure it’s all perfect. The design time on the project was about 2 weeks, luckily, with minimal changes from the client. I think this was largely due to the fact that the client already understood how it was going to look like as he contacted me after seeing the Sony Music Timeline, which they were keen on me keeping close too. YTD: What is the most challenging part of this project? ALEX: The most challenging part of this project was probably what I mentioned previously which was working out how the sheets would fit together to make the columns less noticeable and the whole installation to flow around the room. YTD: Anyone you would like to be thankful for? ALEX: I’d like to thank Rob Antill for documenting the process again, both with photography and video. My printers Lex Media for another great job and being at the end of the phone when I need them. Finally, the client for making this whole thing possible! Check out more amazing works of Alex Fowkes in graphic design and illustration on his official website. Video and photography in this project were provided by Rob Antill. Share us your thoughts about this amazing project by commenting below. Find You The Designer on Facebook, Twitter, Pinterest and Google Plus for more updates. Don’t forget to subscribe to our blog for the latest design inspirations, stories and freebies. Speaking of freebies, check out our free print templates page for your print design needs.